I learned for the first time that aluminum alloy frames are said to have a "life expectancy". This is the bike in question, my 2007 Felt Z80. It has an aluminum alloy frame. 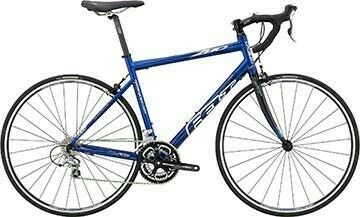 I really like it and don't want to buy another road bike for a while. But it is almost 10 years old. My specific frame is a 7005 series alloy. From what I was told, steel frames show their degradation with rust while aluminium alloy may not show any signs at all even though it is still degrading. How can you tell if an aluminum alloy frame is starting to degrade before catastrophic failure? How long can I expect an aluminum alloy frame to last? Material fatique does happens, it is not caused by time, but due to excessive stress on usage, and/or manufacturing process and/or design fault. If all done under optimal condition, no over stress(e.g. a 120kg person ride it without suspension and under inflate tyre), a aluminium bicycle may last forever. A bang, a fall, can generate impact that stress the frame weak point. If you are not using it for long time, then the stress is little to none, discounting the stress from introduced from bolts/screw/welding joints/mounting temperature contraction/expansion. If you search around stackexchange on the same topics, there is advice that you don't put your bike under the snow : i.e. a concern about welding material contraction different than the frame. But this shouldn't be an issue as long as you didn't move the bike from very cold place to very warm place (i.e., temperature different ~ 20 degree Celsius). Consumer association with loaded funds, such as the German Stifftung Warentest, does indeed test consumer bicycle from time to time, especially for Ebike, due to ebikes are more susceptible to weight stress (the additional motor and battery weight). As some report I read, in 2013, series of ebikes are not satisfied due to the stress test. However, in 2016, many pass the stress test, with exceptional of one bike that with a cracked aluminium seatpost. So it is all about how the manufacture learn to build the bike better. In addition, it is a myth that titanium will fair better when put on stress : it is all about manufacturing process and design. About the "metal deteriorate issues" - A proper maintain steel frame will not rust. Lube and oil them, you will never see the oxidisation - Alluminium "rust" will stop when oxidation form on the outer layer. In addition, steel frame WILL NOT rust, if you maintain it properly. Not the answer you're looking for? Browse other questions tagged road-bike frames aluminum or ask your own question. Life expectancy of a cycle tube and tire? restoring the finish of an oxidized polished aluminum frame? Aluminum alloy or carbon fibre handlebar?